Crystal clear, silvery and slightly glycerous appearance. Initial nose is captivating, fruity at first, then turning sweet gherkin-like. Aeration brings forward sweet, crusty rye bread top note along with roast chestnut and a hint of toffee apple. A very inviting new make nose. The palate is gently spicy and more keenly grainy with an almost chewy texture, tasting faintly peaty. Finishes like quality fresh rye bread with the crusty rye character re-asserting itself in the long, clean, dry aftertaste. Earned 92 points by Nicks Wine Merchants- Melbourne. Notes provided by Belgrove Distillery. 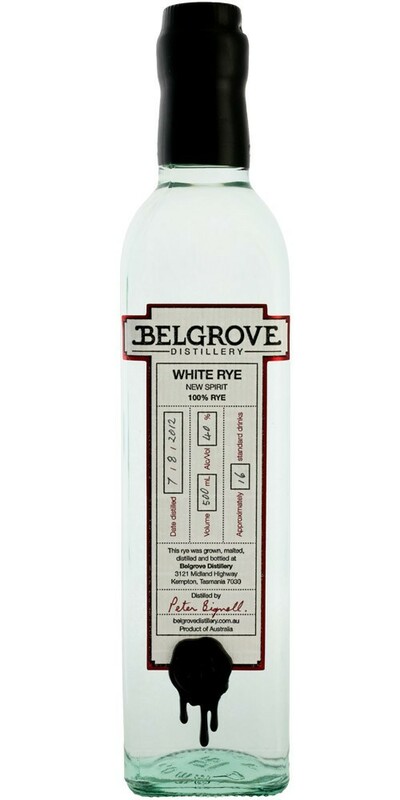 The Belgrove Distillery is a project started by Peter Bignell at his farm in the Midlands of Tasmania. Peter grows his own ryecorn, his whole operation running on biodiesel. The most significant substance brought to the farm is waste cooking oil from the roadhouse next door to make the biodiesel, the only product to leave his property being pure whiskey. Peter’s copper pot still was built from scratch using leftover materials. A few catchwords to describe the Bignell operation are ‘sustainable’, ‘closed loop’, ‘small carbon footprint’, ‘green’, ‘farm based’, ‘value adding’, ‘craft’, ‘low food miles’.